The color of my first slow cooker was harvest gold, and the crock couldn't be removed from the metal casing. That gives you an idea of its age. It had been a hand-me-down from a friend who kept a kosher kitchen which required two sets of all eating and cooking equipment — one set for meat and one for dairy. When she became a vegetarian, she gave away everything that had ever been used for meat, and the slow cooker came into my hands. It looked brand new because it had hardly ever been used, and I was delighted to have a new kitchen toy in my possession. Like many pieces of cooking equipment, it got used a lot initially, then not so much. Mostly it sat in an upper cupboard — the one where I kept the stuff I didn't use much but still wanted. You know that cupboard, don't you? When prolific cookbook author and blogger Robin Robertson put out a call for people to test recipes for her upcoming book on vegan slow cooking, I was intrigued once again by the possibilities of my now-ancient cooker, and volunteered to be a tester. The fact that our slow cooker was still at our old house that we rent-out in Wisconsin, and we we're living in Seattle, didn't seem like much of an obstacle, because after all, wasn't it time to move into the 21st century and get a new, modern appliance that had more settings than just "high" and "low?" I purchased a shiny new six-quart cooker with a removable crock and high, low ... and keep warm — still pretty basic but it gets the job done, though I'm sorry to say it does have a couple of "hot spots" where food tends to stick. Armed with my new toy, I was about to find out that you can make a lot more than soup and stew in a slow cooker! Fresh From the Vegan Slow Cooker starts with hints and tips for choosing and using a slow cooker, and information on ingredients. Then it moves right ahead with snacks and appetizers. Did you know you can make things like warm and creamy artichoke-spinach dip or chickpea, artichoke and mushroom paté in a slow cooker? That's just the beginning. 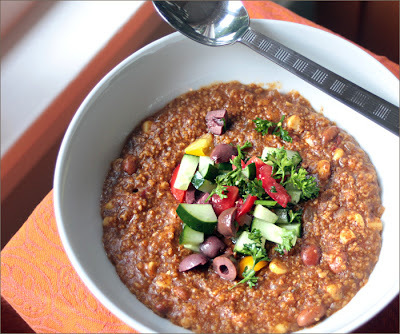 As you work your way through chapters on soups, stews and chili, beans and grains, main dishes, stuffed vegetables, vegetables, condiments, desserts, breakfasts and bread, and hot drinks, you can't help but be impressed and surprised at what can be prepared in a slow cooker. 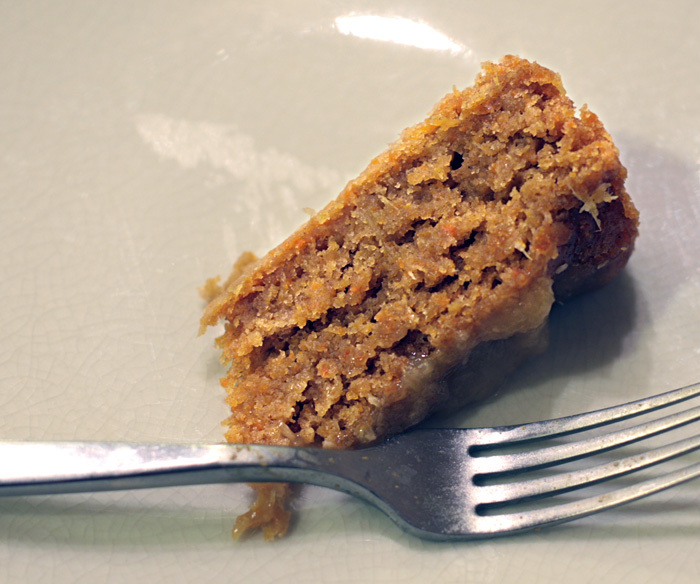 I didn't expect to be testing recipes for cake, for example, or stuffed kabocha squash. The images you've seen so far were recipes I tested for the book, but when my copy of the newly published cookbook arrived, I immediately started looking for something new to try, and the recipe I chose was chipotle-polenta bake. I had all the ingredients, which always makes a recipe appealing, and it seemed so simple to prepare. It was fabulous, but so spicy that without the salsa topping I made, I might not have been able to eat it! When my nothing-is-too-spicy-for-me family recently came to dinner, I made the polenta again, toning down the spices a bit so it tasted just right to me, though it was still pretty spicy; no one at the table added extra hot sauce. My son, who doesn't like polenta, had two servings, and said it was really good. Using a slow cooker can take some of the pressure off when you want something delicious for dinner but won't be around during the day to cook. If you have time to set up the cooker before you leave, you'll find your meal deliciously cooked when you arrive home — not to mention a wonderful-smelling house. 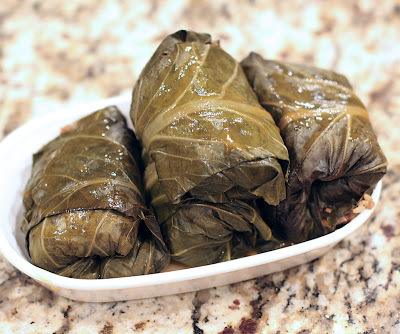 Or, as Robin suggests, you can prep the meal the night before and store the crock in the refrigerator until morning. You can also get a cooker that is programmable if you need more control over cooking times. I like to plan part of a company meal for the slow cooker, so there's one less thing I have to prepare at the last minute. Although using a slow cooker can be a time saver, and the cookbook is filled with delicious possibilities, many of the recipes tend to have a lot of ingredients. Though they are not difficult to assemble, it's a little more involved than just tossing a few things into the cooker. But not much! I plan to use Fresh From the Vegan Slow Cooker a lot, and I recommend it to you as a source for delicious recipes for both every day and special occasions. 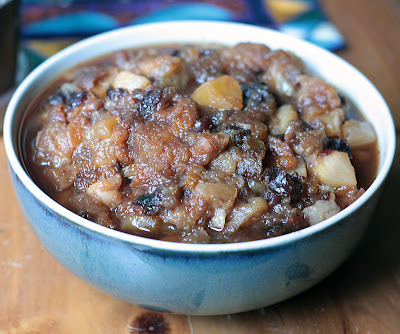 (I can't wait to re-make autumn fruit crock for Thanksgiving.) The two things that would have made the cookbook better are photos of the food (the only photos are on the front and back covers), and not having to turn pages to see complete recipes. Full disclosure: I received a free copy of the book as a thank you for being a recipe tester. All opinions are my own. I've tried out quite a few diet variations myself, and was always convinced the new one was healthier than the last. 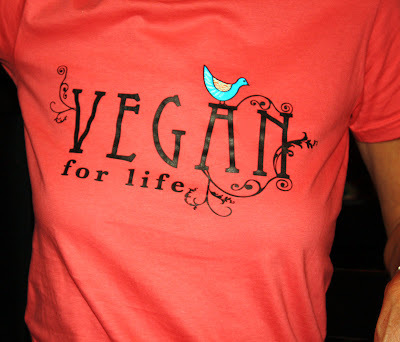 I've been vegan for a long time, and there have been many incarnations of my vegan diet, as well. I'm not vegan primarily for health reasons, but I still try to eat what I consider a healthy, well-balanced diet. 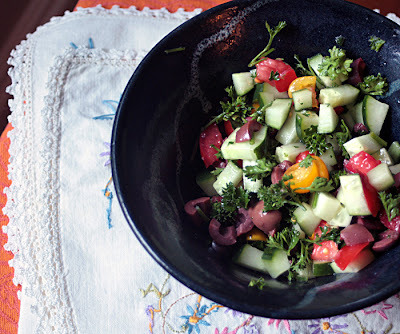 I eat lots of vegetables and fruits, whole grains, beans, nuts, seeds, sea vegetables. I eat a mix of raw and cooked food, the proportions of which vary by season, and I eat a diet that tends to be low in added fat, salt and sugar, but still includes those things. I've always believed that some added fat and salt can be part of a healthy diet, though sometimes I cook without adding them. Most desserts I eat tend to fall into the fresh or dried fruit variety, but that doesn't mean I won't bake a cake or cookies with fat and sugar. When I was asked to review a copy of Bravo!, the cookbook by Ramses Bravo from the TrueNorth Health Center, I was interested but wary. The recipes contain no animal products, which fits with my dietary preferences, but none of the recipes contain added oils, refined carbohydrates, salt or sugar (known as the SOS diet). Oils are supplied by avocados, nuts and seeds, and sweetness is supplied by fruit. I know a lot of people are avoiding salt, sugar and oil, and if you are interested in the ideas put forth by T. Colin Campbell, author of The China Study, and others who advocate a diet free of sugar, salt and oil for optimal health, read on. Many people consider the SOS diet to be transformative for health. After a forward by T. Colin Campbell and an explanation of the TrueNorth Health Center philosophy, (which you can read on Amazon), the book starts with a chapter on how to be an organized cook, that includes tips, lists of tools and two weeks of daily menus. The next chapter contains recipes for basic preparations for foods that are used in other recipes in the book. The main recipes follow, with chapters for breakfast, soups, salads, dressings, vegetable dishes, bean and grain dishes, entrées, sauces and dips, and desserts. 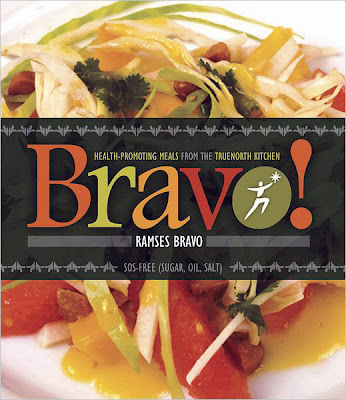 The recipes seem very creative and attractive, as well as healthy, and there are lots that I'd like to try, like Bravo pizza with polenta crust, red lentil loaf with bell pepper coulis, apple-pecan cobbler and mango-banana pie. I do think I'd have trouble with the daily menus because there are so many dishes that rely on other recipes being made first. For example, I'd need gargantuan quantities of home-made vegetable broth, and previously made coconut-vanilla granola to make some of the recipes. 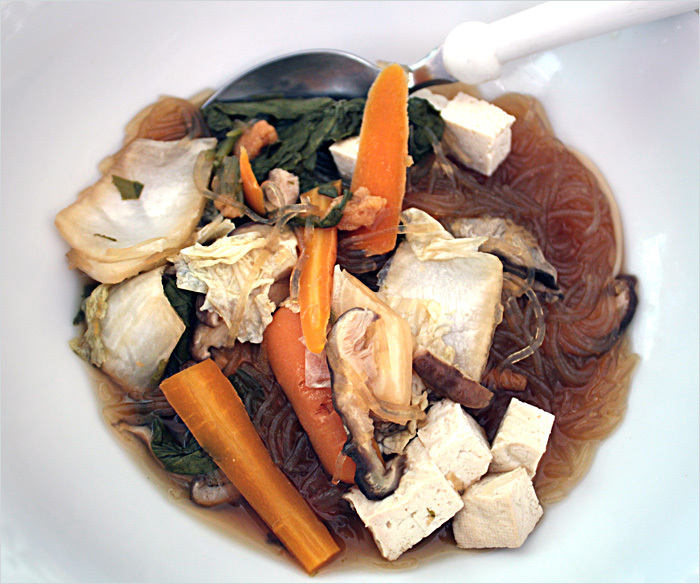 (In fact, vegetable broth plays prominently in many of the recipes, which makes sense as a flavor enhancer.) Perhaps if my diet were more consistently based on recipes such as these, I'd develop an organized way to have the necessary items on hand. 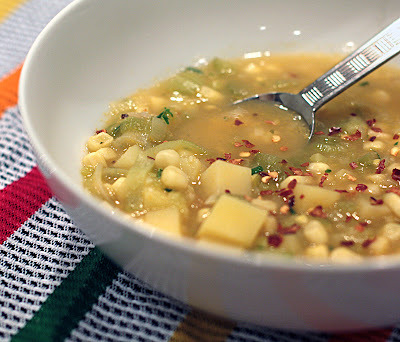 We tried two of the soups, yellow corn chowder and tortilla soup, and were pleasantly surprised each time by the satisfying results. The soups looked and tasted great, and we didn't miss the oil or salt. We cheated a little on prep time by using very-low-sodium prepared stock instead of making our own, though I'm sure the home-made version would have been even better. I'm pleased to be able to share the recipe for tortilla soup with you, with permission from the publisher. 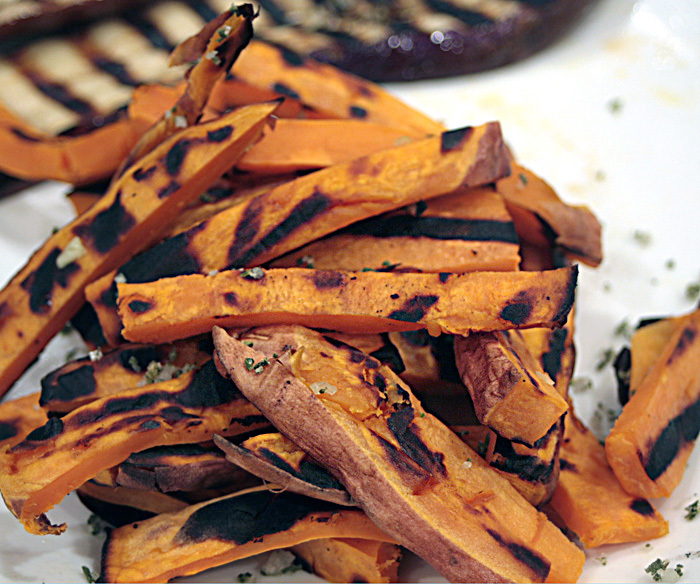 We used sweet potatoes instead of white because that's what we had, and it worked out really well. We also added kale, which we have growing in our garden. 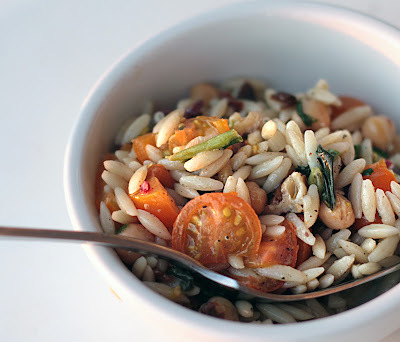 The second night we added brown rice and butter beans for a more complete dinner soup. Slice the tortillas into small strips. Arrange them in a single layer on a baking sheet and bake for 10 minutes until crispy. Put the corn, celery, carrot, shallots and garlic in a large dry pot and cook over medium heat fot 5 minutes, stirring occasionally. Stir in the oregano, granulated garlic and granulated onion and cook, stirring frequently, for 5 minutes. Put the tomatoes in a blender and process on high speed until smooth. 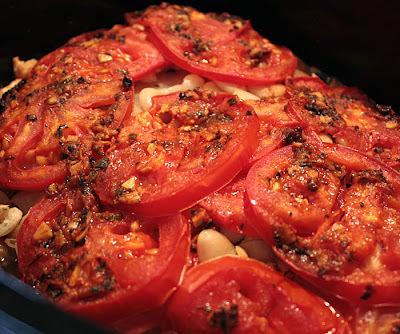 Add the tomatoes and potatoes to the pot and cook, stirring occasionally, for 5 minutes. Stir in the broth and increase the heat to medium high. Simmer for 15 minutes. Stir in the epazote and simmer for 5 minutes. Ladle into soup bowls and garnish with the avocado, cilantro, and lime. Serve immediately. NOTE: This recipe results in a brothlike soup. 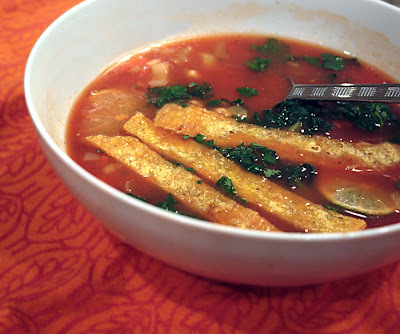 For a thick and creamy soup, put the soup and baked tortilla strips in a blender and process on high until smooth. Serve immediately garnished with avocado, cilantro and lime. Full disclosure: The book was provided to me free of charge. All opinions are my own. The recipe is reprinted with permission. A couple of weeks ago we got our very first gas grill. After much Internet research into brands and sizes, we found a hardware store with the grill I was interested in, and went to see it in person. I quickly realized it was a lot smaller than I thought, and decided the next size up would work better for grilling copious amounts of veggies rather than skinny hot dogs and a few burgers. We bought one. Oh, I know. Big deal you're thinking, so they got a grill. Everyone has a grill. Yes, but now WE have a grill, too, and we've been grilling just about every night. We've gone a little grill-crazy — maybe to make up for lost time. 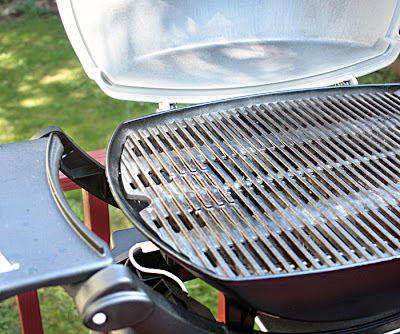 We purchased a Weber Q Series portable grill and a stand. We got the Q 220. The Q 220 is has an electronic starter (powered by a small battery) so you just turn it on and it lights — so far, anyway. Although the Q is considered a small grill, that doesn't mean it comes with a small price. I was kind of waiting for an end of summer sale before we bought the grill, but if I waited any longer, the summer really would end and I didn't think we'd want to be grilling in the rain and cold. But you never know — this grilling thing is very cool, and we're enjoying ourselves immensely, so maybe a little rain won't stop us. First of all, I'm amazed at how quickly we can get a grilled meal on the table. 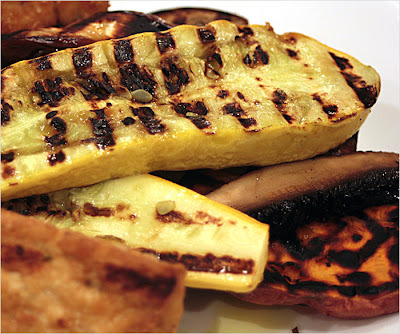 I'm not talking about fancy marinated this and that, but a fabulous, basic grilled veggies and protein affair. For example, we grilled zucchini, eggplant, hatch chile pepper, portabella mushroom slices, sweet potato and tofu in 40 minutes start to plate. We cooked the sweet potato in slim slices (about 1/2" thick), then sliced the slabs to look like fries, after they were cooked. The eggplant and summer squash were sliced lengthwise into steaks. (Other times I've cut the squash into chunks and skewered them with onions and mushrooms.) I gave the veggies a very light coating of olive oil before grilling. 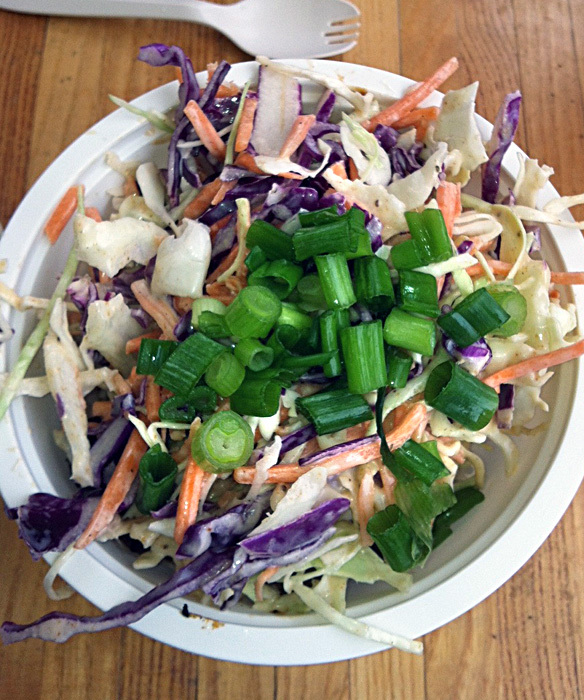 While my husband attended the veggies on the grill, I made chipotle coleslaw using a very thinly sliced small cabbage, shredded carrot and chopped scallion. I made a dressing with a small amount of vegan mayo, chipotle in adobo, cider vinegar and a little sweetener, and a dash of herb salt. I don't like my coleslaw oozing dressing so I used a pretty small amount — about a tablespoon of mayo and a teaspoon of chipotle in adobo. We bought the mushrooms already sliced because the cost was almost the same as the whole ones, and they were grill-ready. The tofu was fried tofu from a tofu shop that we were basically just heating on the grill, not cooking. The veggies taste so amazing right off the grill, we almost never even add salt — though sometimes I remember to add a little herb salt. 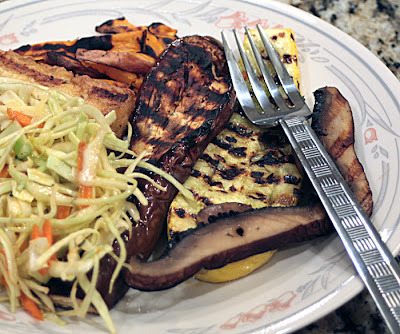 In addition to what I've already mentioned, we've grilled onions, yellow potato slices and tempeh. 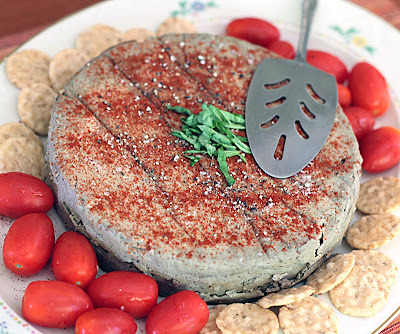 The tempeh was blanched and marinated because my husband made it, and he was following a recipe, but I probably would have just tossed it onto the grill. I've got some super-firm Wildwood tofu in the refrigerator waiting for me to decide how to grill it. Any suggestions? After the thrill of our new toy wears off, I may opt for some fancier preparations, but for now, we're really enjoying our fast and easy grilled suppers. One thing I do want to try, though, is grilling a whole eggplant to make a traditional, smoky version of baba ghannouj. It's got to be easier than grilling it on the stovetop. Our room on the top left. While we were having dinner with friends one night in Madison, they told us their daughter was attending grad school in Eugene, Ore., and they were going to meet her on the Oregon Coast in August for a vacation. "Say, why don't you meet us there?" they suggested. They also mentioned their ocean-front room had a kitchenette and their daughter (who we first met when she was a toddler) was an excellent vegan cook. 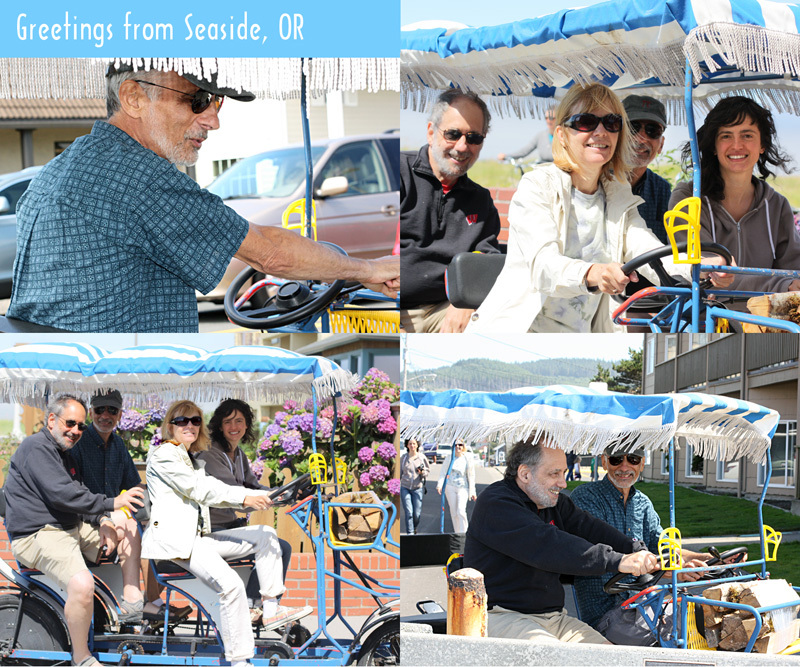 They had picked the town of Seaside because they liked the name, and I kind of liked the name, too. "We'll see," I answered. 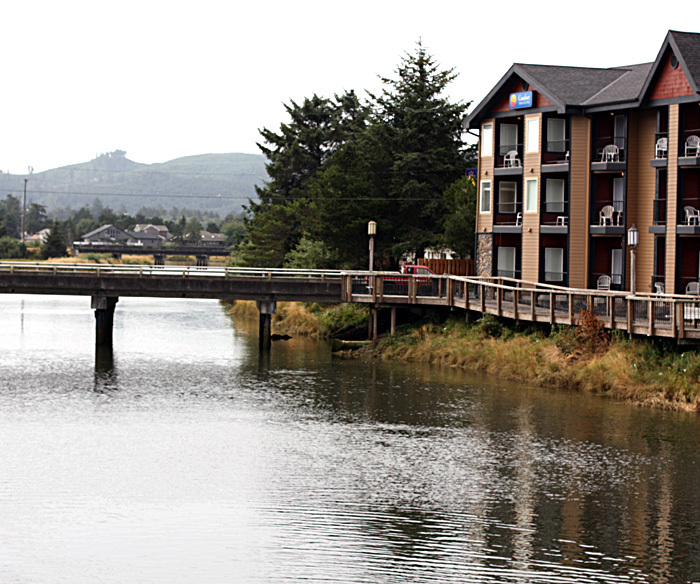 Once we got back to Seattle, one thing led to another and we found ourselves with hotel reservations in Seaside. Maybe. 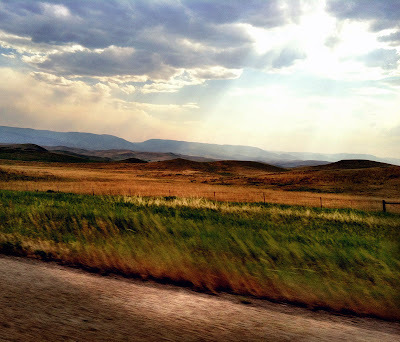 We planned to leave about 1 p.m. for the 3-hour drive, after spending the morning caring for Miss E, but my husband had a sudden bad feeling about the hotel when he realized he'd never received a confirmation. He hastily called the hotel, and they had no record of our reservation, no rooms for Thursday or Friday, and nothing open until Saturday. He reserved for Saturday and Sunday and went to take care of Miss E while I started searching the Internet for a place to stay. Seaside is a very popular place, and not a room was open. I tried nearby towns, but nada. Suddenly a room opened up in Seaside and I grabbed it. It wasn't on the beach with an ocean view balcony like the first hotel, it was in town with a river view balcony ... and a hot tub! With enough hot water to fill it. Part of the downtown Seaside atmosphere. My husband describs Seaside as a polite honky-tonk, and that seems about right. Although there were hoards of people, restaurants, bars, touristy shops and amusements like a small-scale train ride, bumper cars, a tilt-a-whirl, a shopping mall with a full-sized carousel and an huge, beehive of a gallery full of old arcade games, it wasn't too rowdy or excessively loud on the street. Just a little bit crazy, and we loved it. This makes me want to pack up the car and head to the beach in Seaside. 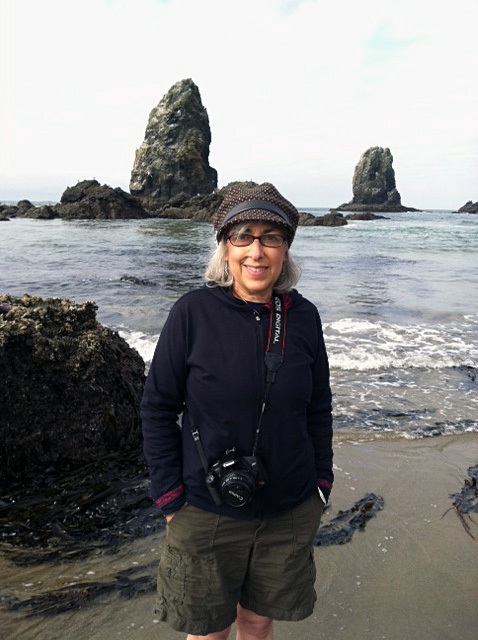 Although our friends were a mere six blocks away, they were in a whole different world of quiet beach and ocean vistas. But for two days, we enjoyed the split personality of the friendly coastal town of Seaside, spending time both on the enormous, serene beach, and in the busting town center. I even found a resale store called Tri-City Spay and Neuter Thrift Shop — right up my alley, with all profits going to spay and neuter rescue dogs and cats. Had to buy something, of course. 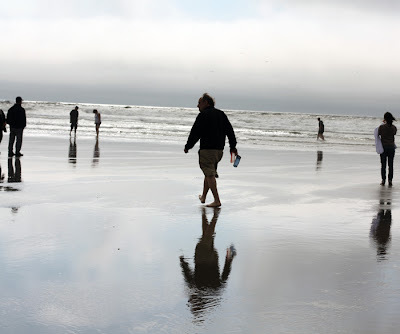 The temperature farther inland may have been in the 80s, but that wasn't the case on the coast, where for most of our visit we needed sweatshirts on the beach, but that didn't stop us from having a great time. 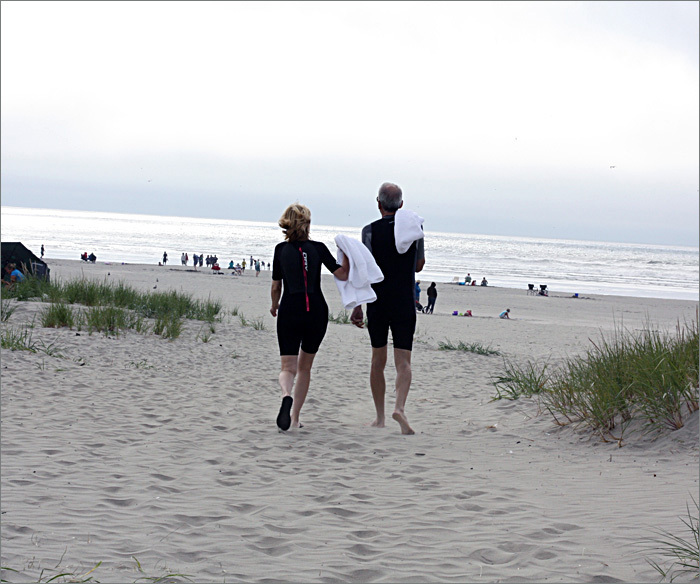 Our friends came prepared for cool weather, and ventured into the chilly ocean in wet suits! 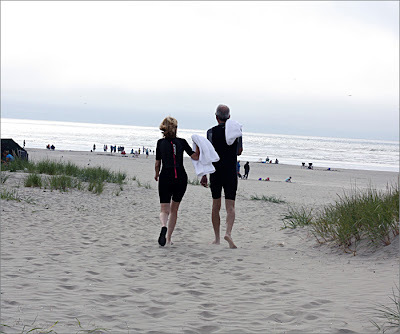 They said it was amazing, and having a wet suit made all the difference between enjoying the water or freaking out. Lisa, as our friends had said, was a fabulous cook. 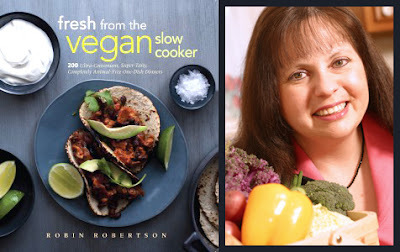 I don't know how she did it in the tiny kitchenette, but armed with a copy of Robin Robertson's Quick Fix Vegan for inspiration, she produced two stellar meals. The first was Sicilian-style pasta and the second an amazing lentil and Swiss chard soup. 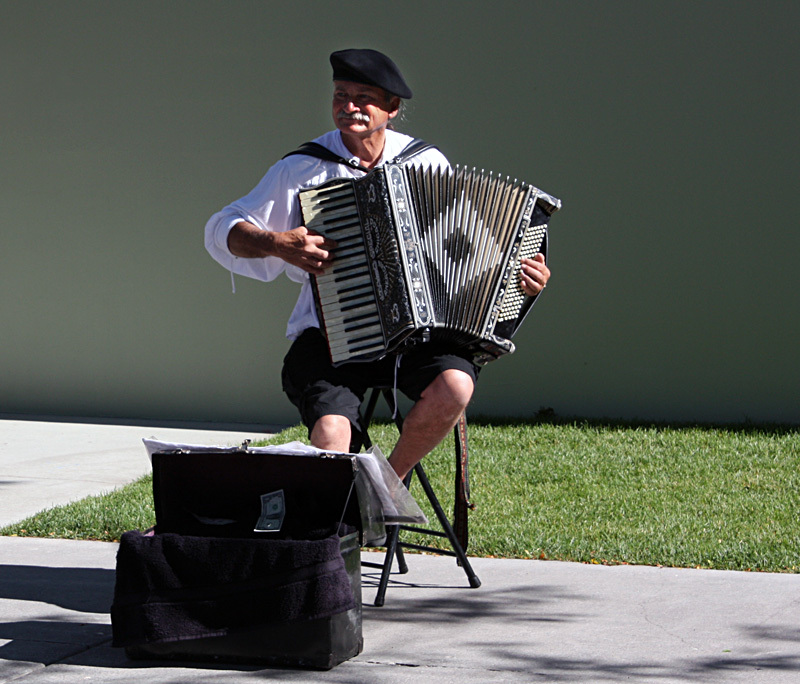 On the third day of our visit, we moved to the hotel on the beach, completely altering our Seaside ambiance. 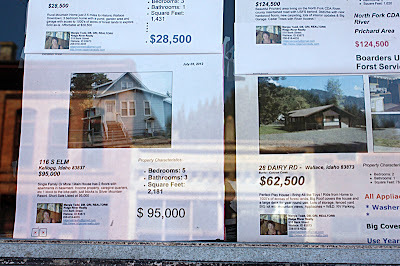 No more hustle and bustle outside our door, but the change in locale didn't totally alter the nature of our experience. Seaside's aura had a compelling influence on our friend, John, who decided that we had to rent a pedal surrey and ride around town for an hour, like the other crazy tourists. He was right about that. 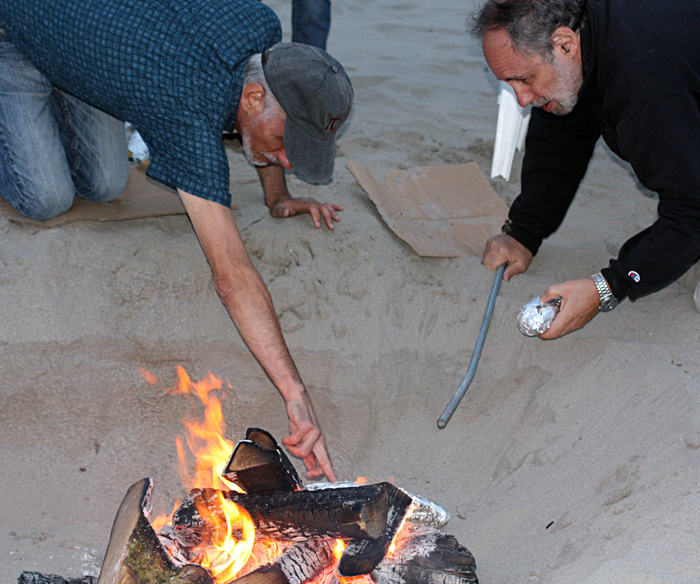 We also succumbed to the lure of building a fire on the beach at night and having a cookout. We cooked potatoes, corn-on-the-cob and tofu pups on sticks. Our hotel room was on the top floor just kitty-corner to our friends' room one floor below. We could stand on our balconies and make plans. 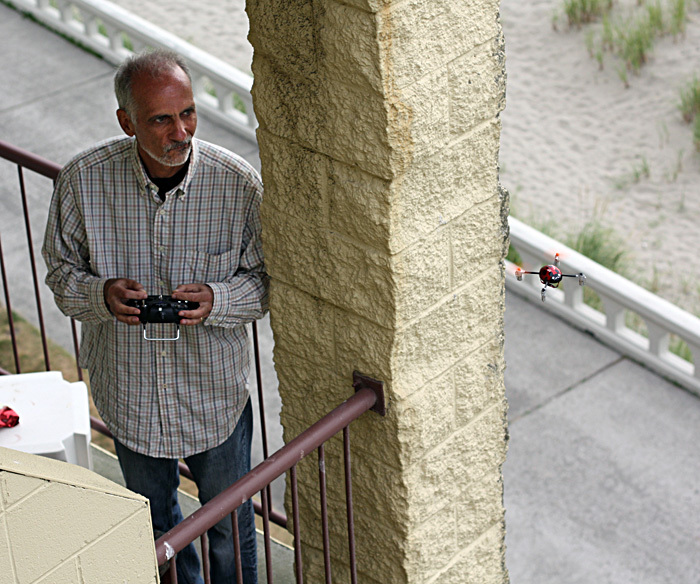 Or see interesting activities like flying radio-controlled helicopters. 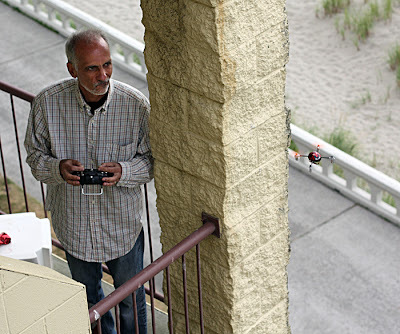 John, who describes himself as an electronics geek, looks slightly dismayed here because he had just lost control of his helicopter, and it was about to make an unscheduled landing three floors below. John doesn't just play with this stuff — he builds it. 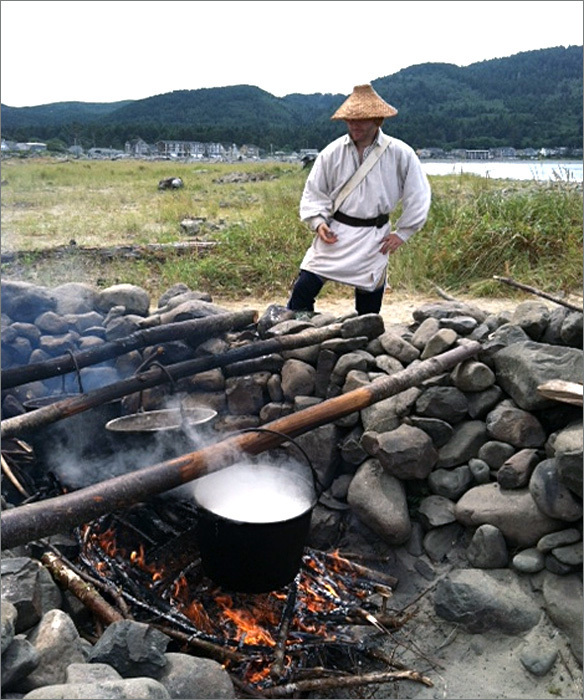 More fire-builders at work — boiling seawater to make salt. 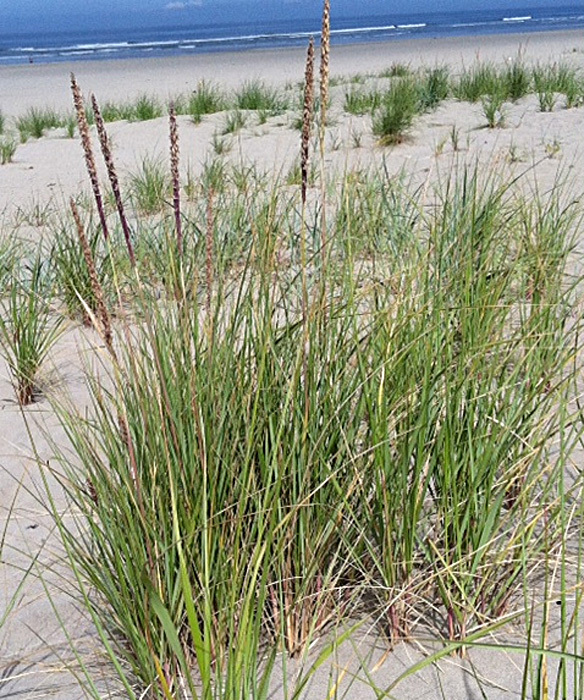 Seaside has a historic 1-1/2 mile-long promenade bordering the edge of the beach. We did quite a bit of walking up and down the Prom, and on one of our walks we visited a historical re-enactment of the Seaside saltworks, which was originally built about 1805 by a group of men from the Lewis and Clark Expedition. We were allowed to take photos with our phones but not use them for any other purpose. Nor were we supposed to discuss anything that wouldn't have been a topic of conversation in the early 19th century. 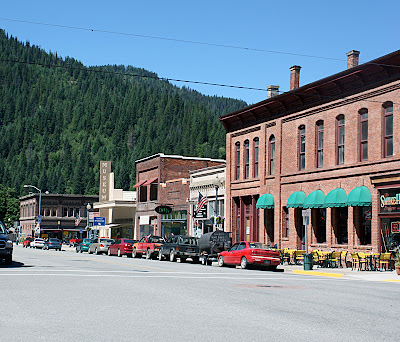 We didn't spend all of our time in Seaside, as there were interesting nearby towns to explore. 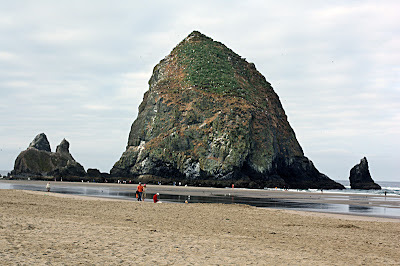 Cannon Beach is known for the impressive 235-ft. Haystack Rock, which is only accessible during low tide. 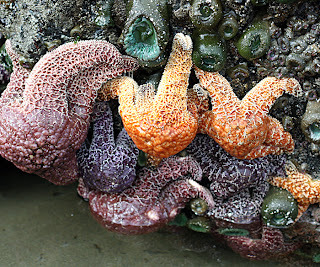 At low tide you can access the tide pools to see glorious examples of sea life. Starfish and sea anemones clinging to Haystack Rock. We headed there very early one morning so we could view the amazing, colorful star fish, sea anemones, etc. 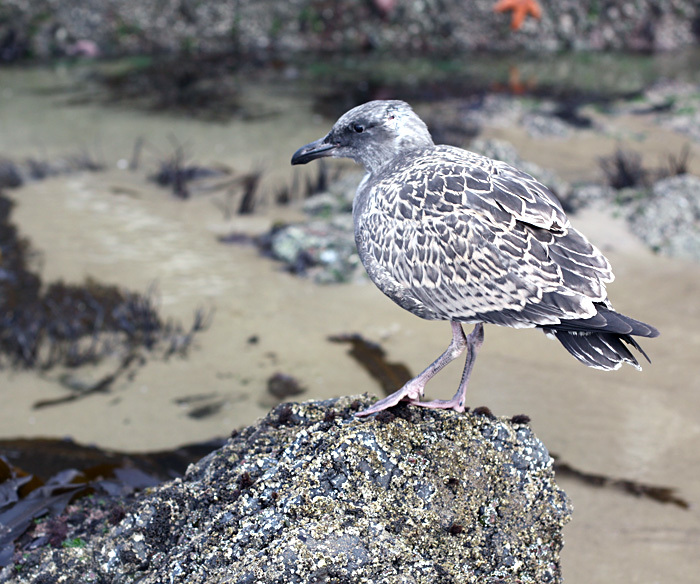 that cling to the rock or live in the tide pools. I had my camera with me but had neglected to notice my card was nearly full, and this was the only shot I got before I had to start deleting photos, so I could take a few more pictures. In addition to the underwater creatures, there were tons of seagulls. Here you see a juvenal seagull who hasn't yet learned that he's supposed to be afraid of people. 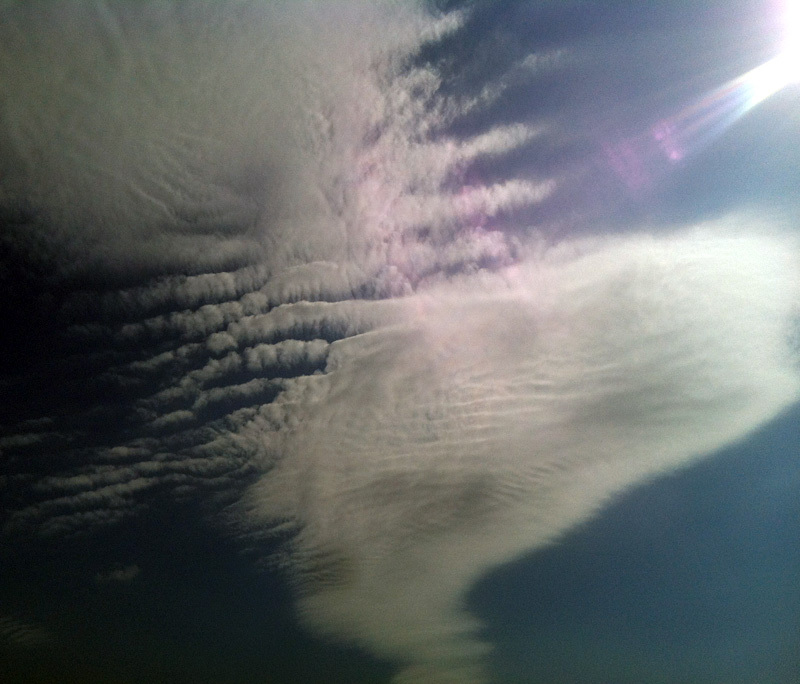 Since I was unable to take photos with my usual abandon, I ended up being in them, instead. 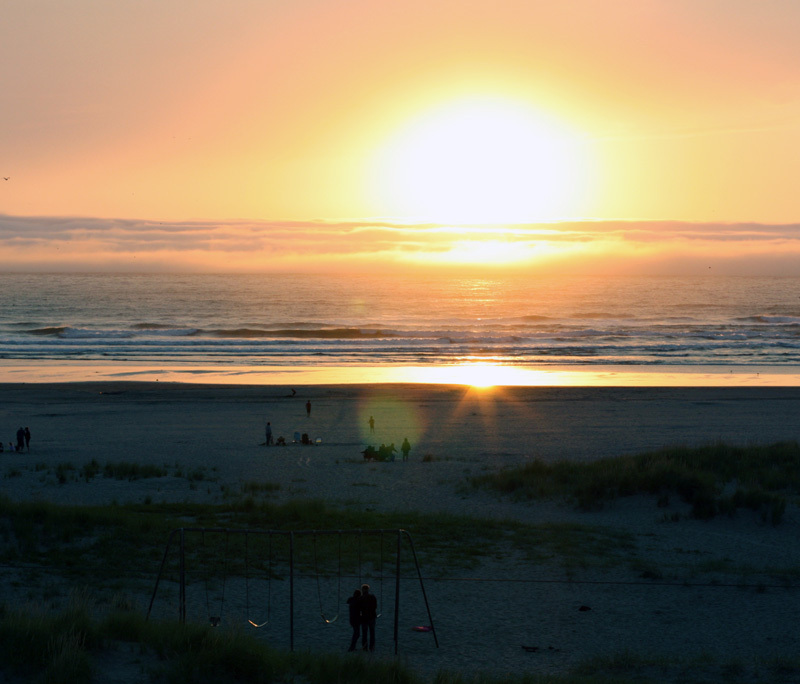 One morning, we spent a couple of hours in the nearby town of Manzanita. 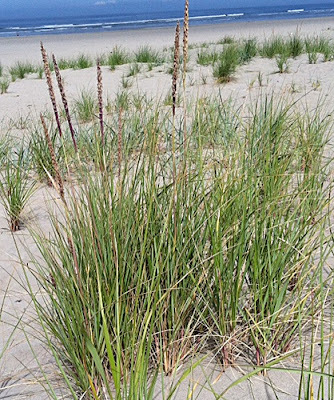 As we approached the beach, we could see a huge crowd gathered near the water's edge. What was it, I wondered — a beached whale? — sharks? an injured swimmer? 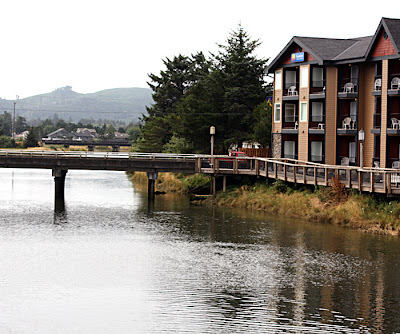 Upon entering Manzanita, it was clear that this was a subtler, more upscale village than Seaside, but not so upscale that they wouldn't host the annual festival of Muttzanita, complete with a dog parade, dog fashion and talent show, doggy spa and more. The first part of the festival takes place on the beach, hence the crowd. 100% of the proceeds go to United Paws and the Rotary Club, so I'm happy to wear the Muttzanita t-shirt I got talked into buying by a very serious volunteer. Who wouldn't want their own Muttzanita t-shirt? Not just in Manzanita, but everywhere we went on the coast, the welcome mat was out for dogs. 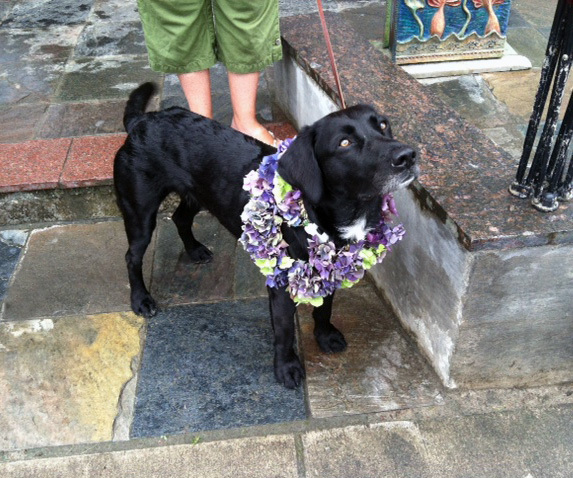 They were welcome at the hotels, on the beach, the Prom — every place we visited was filled with dog-love. It was nice. 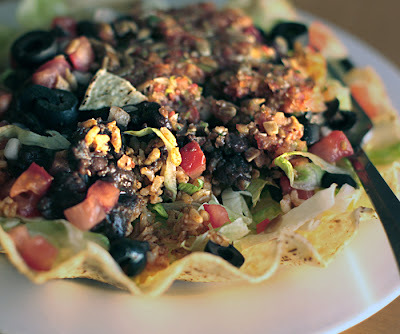 We went back to Manzanita the next night for vegan Mexican food from Left Coast Siesta. Everyone else had burritos, but I had a giant taco salad in a huge fluted corn tortilla. I thoroughly enjoyed it both for dinner and the next day for lunch. 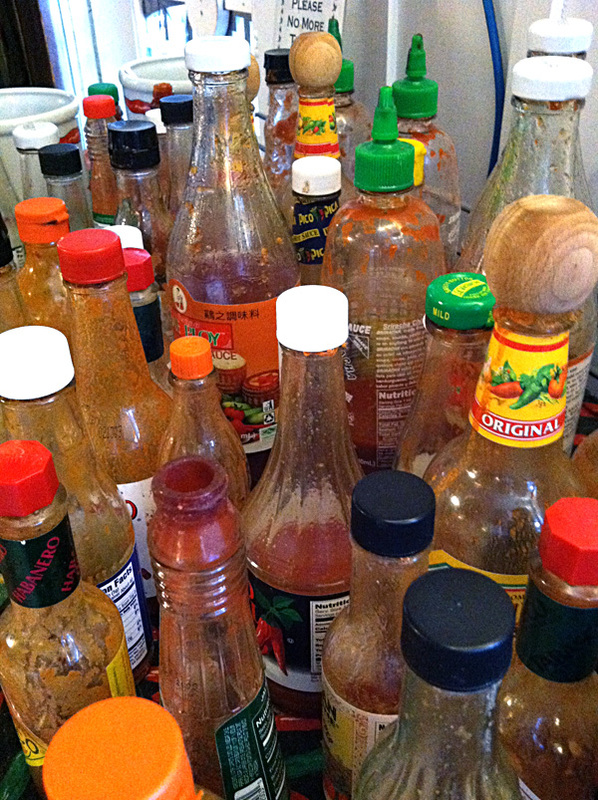 This is a partial view of the condiment (i.e. hot sauce) table. 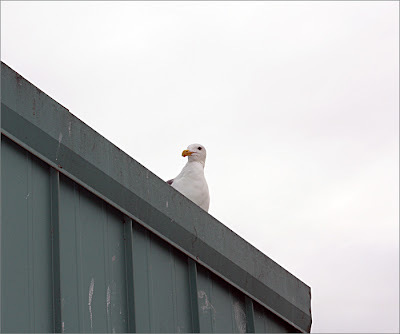 Meanwhile, back at the hotel, I made friends with a seagull who came every day to peer at me from the overhanging roof. 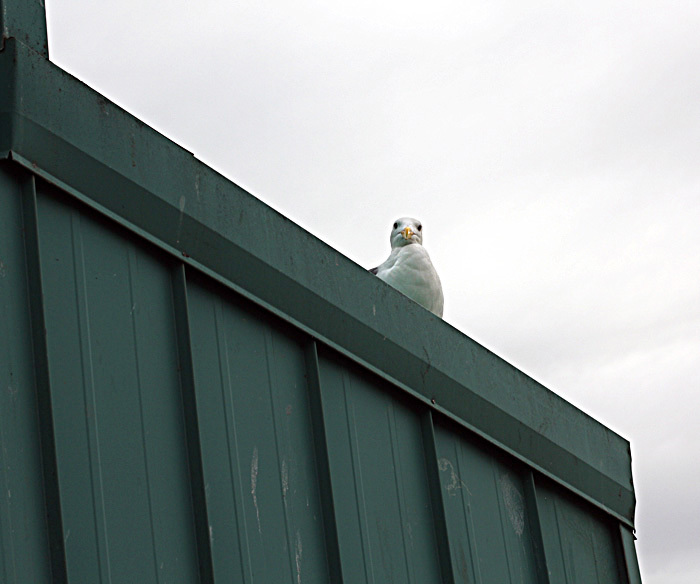 I'm sure he was trying to enroll me in some sort of food donation program, but I didn't have any fish to offer. I placed a piece of carrot on a chair but he never expressed interest in that. Not a vegan, I guess. You can see groups of people with their fires. 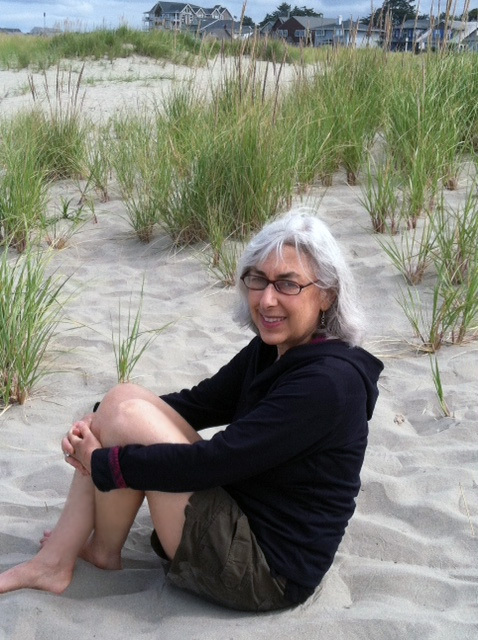 And one last morning on the beach — a beautiful, warm (!) morning. We went out very early so we could walk along the beach at low tide. The beach is so wide at low tide it feels like you're miles from the town. We had a wonderful walk, and even found a few sand dollars for souvenirs, then sat on the beach for a while working up the courage to leave such a beautiful and relaxing place. After four great nights in Seaside, we headed to Portland. 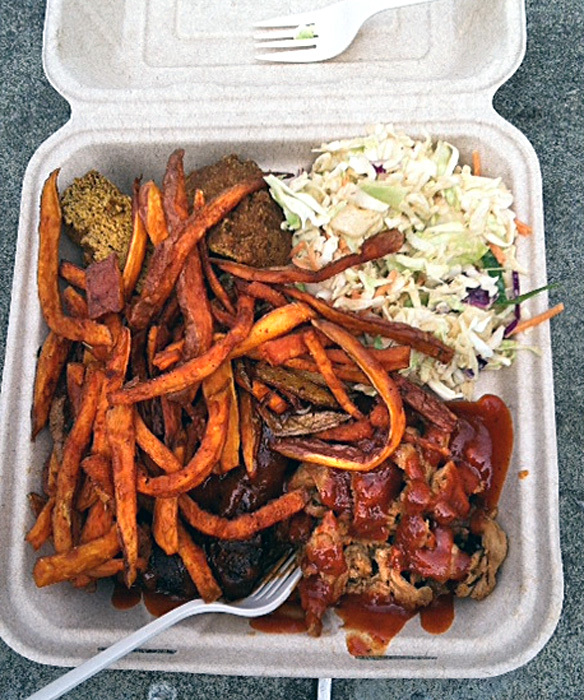 I was on a mission to eat at Blossoming Lotus and a couple of food trucks — Homegrown Smoker and Native Bowl. I'd eaten at Blossoming Lotus when I attended Vida Vegan Con, but I'd missed the food carts, and wanted to atone for that. 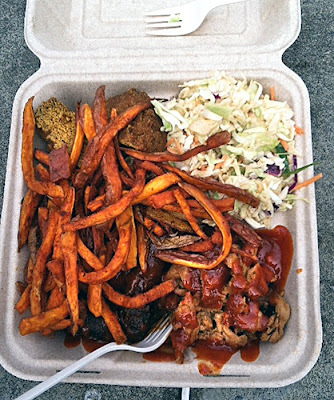 For lunch, my husband and I headed to the Homegrown Smoker food cart, and we shared an enormous platter of smoked soy curls, tempeh ribs, sweet potato fries and chipotle slaw. The two of us enjoyed every gluten-free bite, but I sincerely hope no single person attempts to eat this alone. We had our farewell dinner with John, Yvette and Lisa at Blossoming Lotus. 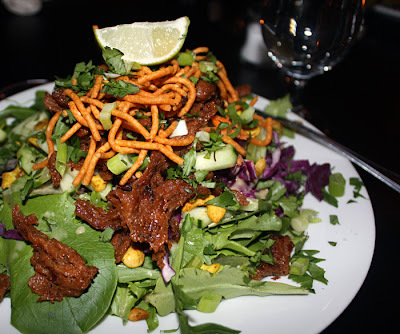 Although I tried to order something I hadn't had before, I couldn't stop myself from ordering Crispy Thai Barbecue Salad. I think I can move on to something else next time (now that I know what I know about barbecued soy curls — future post). 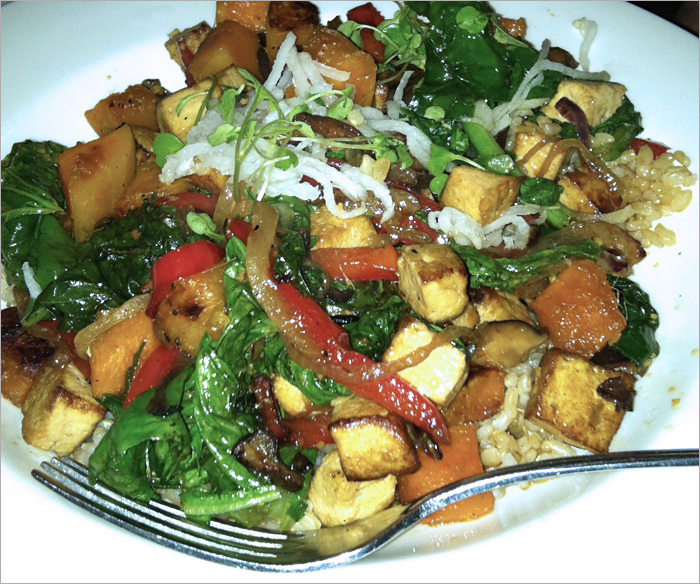 My husband had (I think) Wok Tossed Tofu and Greens. Both of us were content. The other popular dish at the table was Vindaloo Masala. No complaints about Blossoming Lotus on this trip. John, Yvette and Lisa departed early the next morning, but Ken and I had one more food truck to visit. We went to Native Bowl, and loved our very fresh and crunchy lunches. Honestly, I don't remember which bowls we ordered, but I think any of the choices would be fabulous. Much to our surprise, Homegrown Smoker has a second food truck location right by Native Bowl, and I'm embarrassed to admit that we bought another big platter of Smoker food to take back to Seattle for dinner. This greatly amused our Homegrown host. As I've already mentioned in previous posts, this has been a long (a good thing) and crazy (some questionable aspects) summer, and my posting so far has been out-of-order and disorganized, with lots of holes. This is a little hard on me, as a somewhat organized person, to deal with. Do I just forget about posting stuff from July and early August and move on, or keep sneaking old stuff in to more current posts? Do I review books that have been waiting in a pile, post recipes I've tried recently, or talk about restaurants from the summer? I think I should stay in the present, but it's no use pretending that it won't drive me nuts to just ignore July and August. I think I've got to get through the summer antics before I can move on to the present. It will just bug me if I don't. Lucky for you (or not, if you like travelogs) I barely broke out my camera, so there are relatively few photos, and many are of the phone variety. 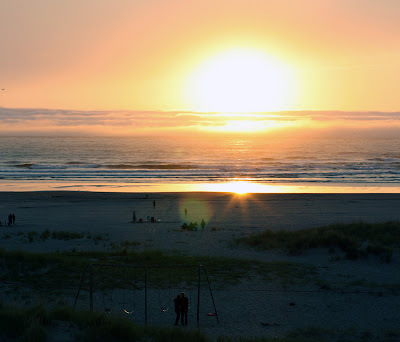 I guess I'll just start with the Midwest portion of the summer today, move on to the Oregon Coast, and then tackle recipes, cookbooks and such. Let's start with Madison, where we spent most of July. Most of the restaurants in Madison tend to be vegan-friendly, but there's only one certified vegetarian/vegan restaurant in town — The Green Owl. Every summer we end up going there multiple times but never get tired of it. We go out to eat a lot with friends while we're in town, and it was especially true this summer when it was super hot for much of our visit, and no one wanted to cook. 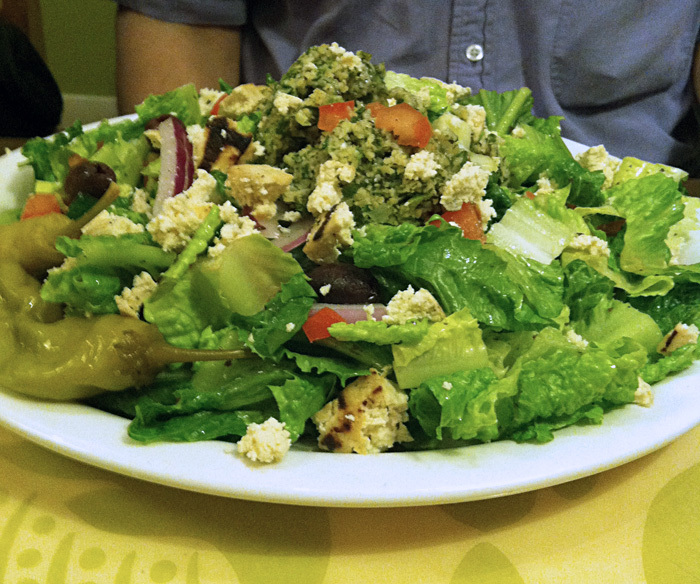 Most of our friends are omnivores, but they are always willing to hit up The Green Owl. 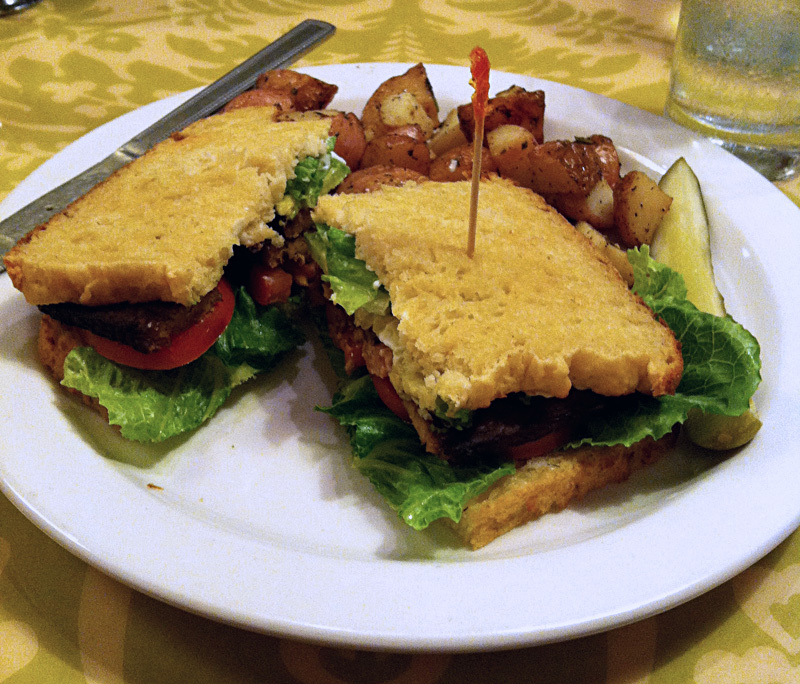 The sandwich at the top of the post is a TLT With Avocado and a side of roasted potatoes, and it was delish. Green Owl makes its own GF bread and I like it better than wheat bread. My husband always orders a Greek salad with lemon-grilled tofu instead of ricotta. The little white blobs are cauliflower. One night we even had a slice of amazing raw, GF coconut cream pie, but alas, I gobbled it up before I even thought of taking a photo. 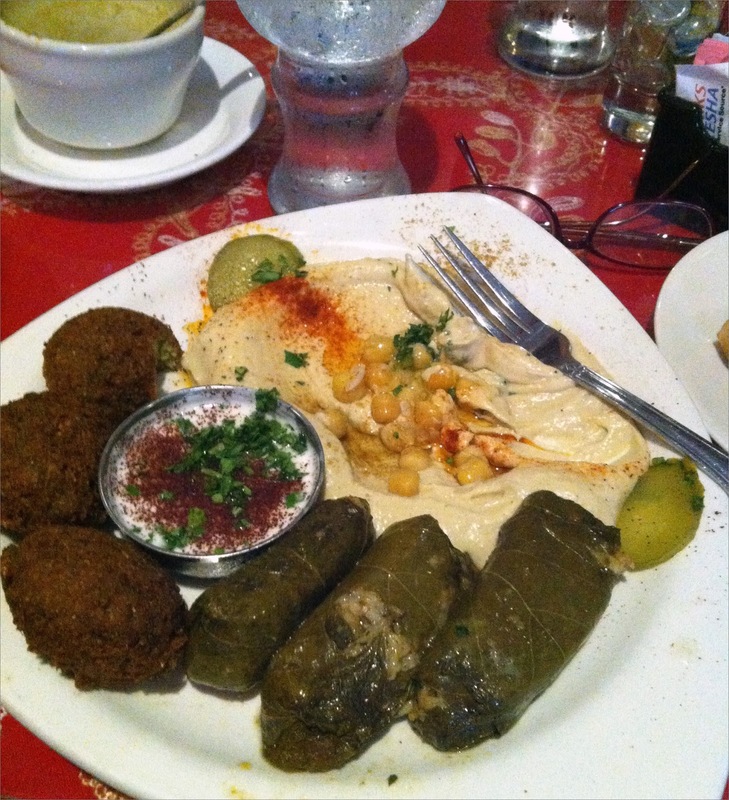 Another place we enjoy visiting is The Nile, which serves great Middle Eastern food. On one of our visits I ordered a cup of lentil soup and a mixed platter, and though I checked on the veganness of everything, it still came with yogurt. Oh well, easy to remedy. One of the reasons it's easy to eat out as a vegan in many of Mad-city's restaurants is thanks to Dave, the organizer of the Madison Veg Meet-Up group. He works closely with restaurants to provide vegan meals for Meet-Up events, and the restaurants learn how to provide meals for vegan customers. Now, when we say the word "vegan" in restaurants where meet-up events have been held, they know what we mean. Kind of. 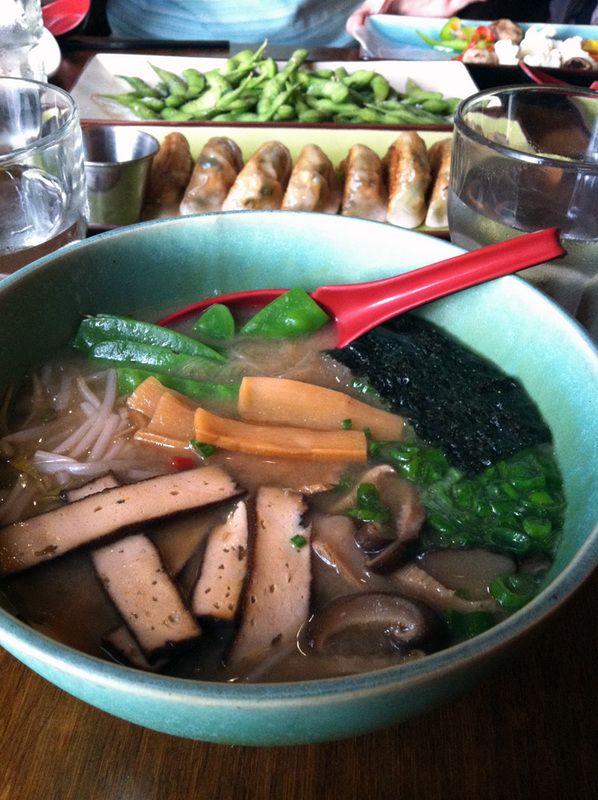 We tried some new places this year, and one of them was Umami Ramen and dumpling Bar. 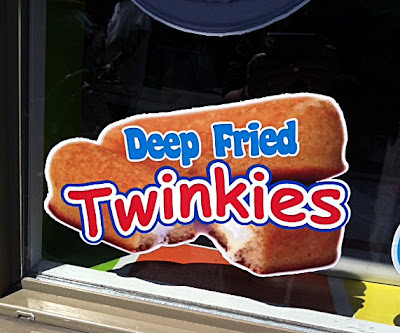 As you might expect, this is not an ideal place to visit if you are both vegan and gluten-free. Though you can find something to eat. It's not especially easy being just vegan here, either — I'd describe it as limited but possible. I had a bowl of vegan ramen which was very tasty. Behind my soup you can see vegan dumplings and edamami. 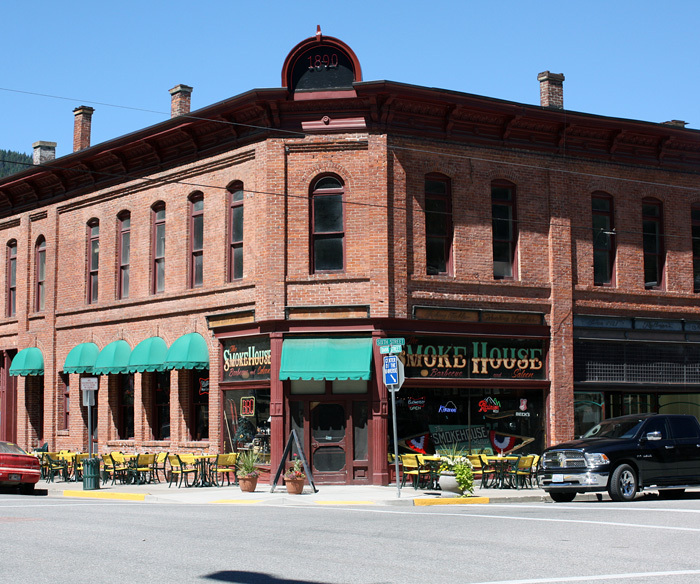 That's all I've got for Madison, though it's just a sampling of the restaurants where we dined. It doesn't, for example, include a vegan meet-up at Ian's Pizza which was pretty interesting. (Anyone for mac 'n cheese pizza?) After the event, Ian's decided to make every Monday night "vegan night." It wasn't that long ago that I was unable to go to Ian's for lunch with co-workers because they couldn't come up with a vegan slice. Thanks, Dave! 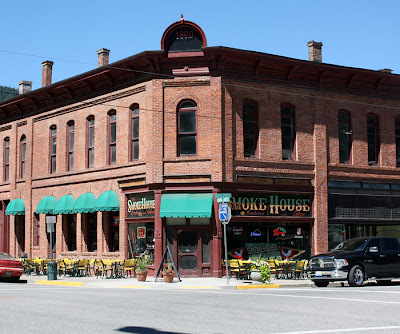 When we travel between Seattle and Madison we tend to spend nights in the same towns every year, and though we have favorite places to eat in the towns, on this trip we went to a few restaurants we had never been to before. Both on the way out, and back, our favorite (and the only) Ethiopian cafe in Sioux Falls, South Dakota, was closed for various reasons, and we were forced to find a new venue. We ended up at Tokyo Japanese Restaurant. Our server seemed to understand our request for vegan food and steered us towards the available options. 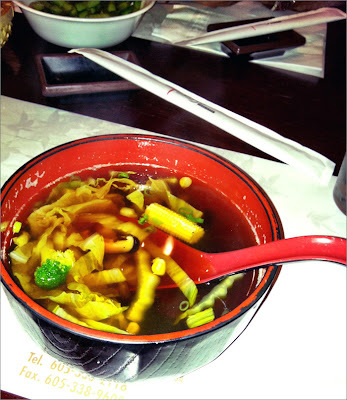 I had edamame, veggie sushi and veggie soup. All were better than I'd hoped. My husband had a veggie and udon noodle dish which he seemed to enjoy. Now we have two places to eat in Sioux Falls! Stolen from the Community Coop Web site. Sorry, Coop, please don't sue me. On the road, we tried a new tactic for making the trip more pleasant this year — on both the way there and back, we stopped at a couple of places to relax a bit to enjoy a snack or a short tour. This actually made the day's drive seem shorter, though that seems counter-intuitive. 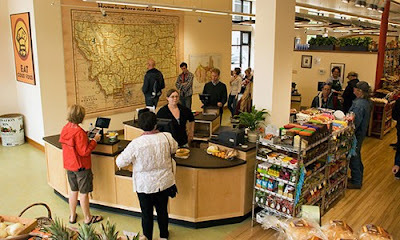 In both directions we stopped at the Community Food Co-op, in Bozeman, Montana. 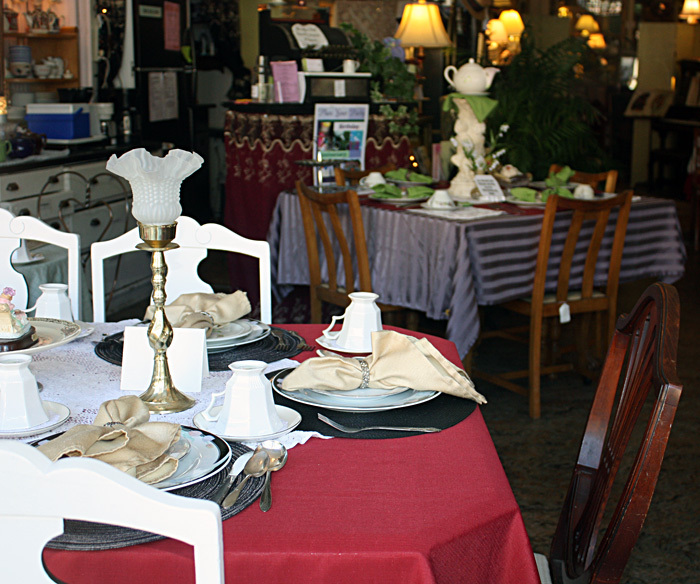 We love the beautiful Coop, especially the top floor restaurant and juice bar. On the way to Madison we stopped for tea and green juice, and took advantage of the free wifi to register for the next Vida Vegan Con. On the way back to Seattle we stopped for green juice and also to purchase a tee shirt for Miss E.
We also stopped in Sheridan, Wyoming and had dinner with Laurie, the blogger extraordinaire who writes Mehitable Days, and her delightful husband, BW. Now, I hope Laurie will still be my friend after she sees this. Although my husband and I thought the photos I took of them were very nice, Laurie and her husband hated them, and I promised not to put them on the blog. 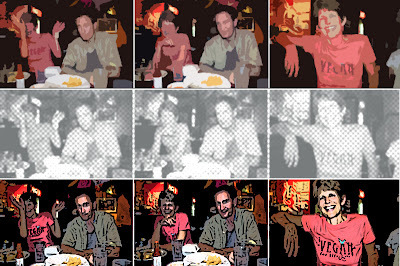 But, I had a little fun playing with the images to make a collage, just to prove we were actually there! They took us to Olivia's Kitchen, a Mexican restaurant we had never been to, and we all had delicious burritos. Sorry, Laurie and BW, but you have to admit I disguised the two of you well! I promise never to take your photo again. I will only take pictures of food. I'm not going to disguise the fact that I was thrilled to see Laurie wearing a t-shirt I designed. What an honor that she chose to own it! At the Missoula farmers market. In Missoula, Montana, where we spent a night, we visited the downtown art walk in the evening, and the farmers market the next morning. At one of the galleries on the art walk there was a very large, arresting painting of a cow that I was completely taken with, but it was so expensive, as in thousands of dollars expensive, and so incredibly large, that I reluctantly had to leave it behind. At the farmers market, I was surprised at the lack of organic produce, but we still managed to snag some Flathead cherries, and a melon. I didn't take nearly as many travel photos as I usually do, but I thought this one came out really well considering I took it with an iphone pressed against the car window! I might have to paint it. 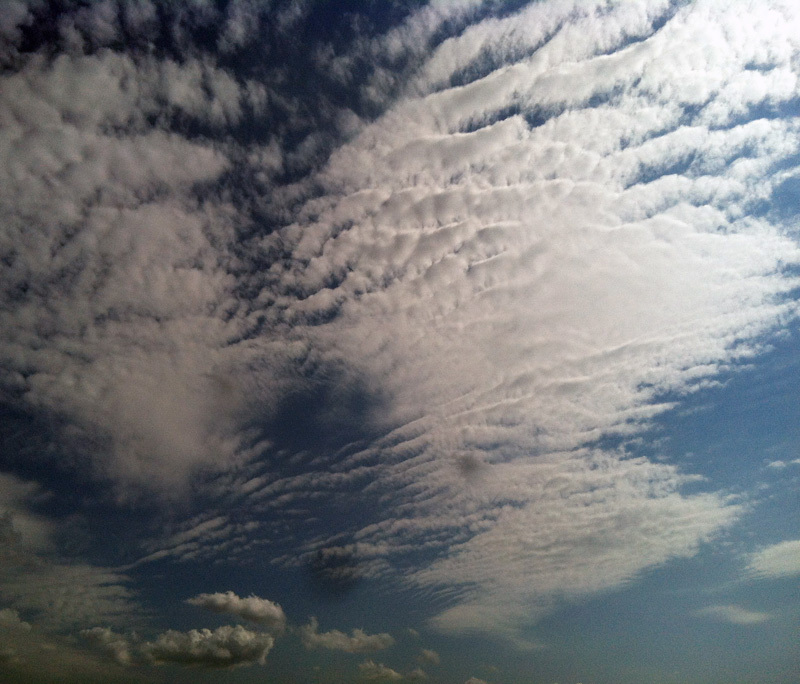 And I'm very fond of these cloud shots, taken with the same method. 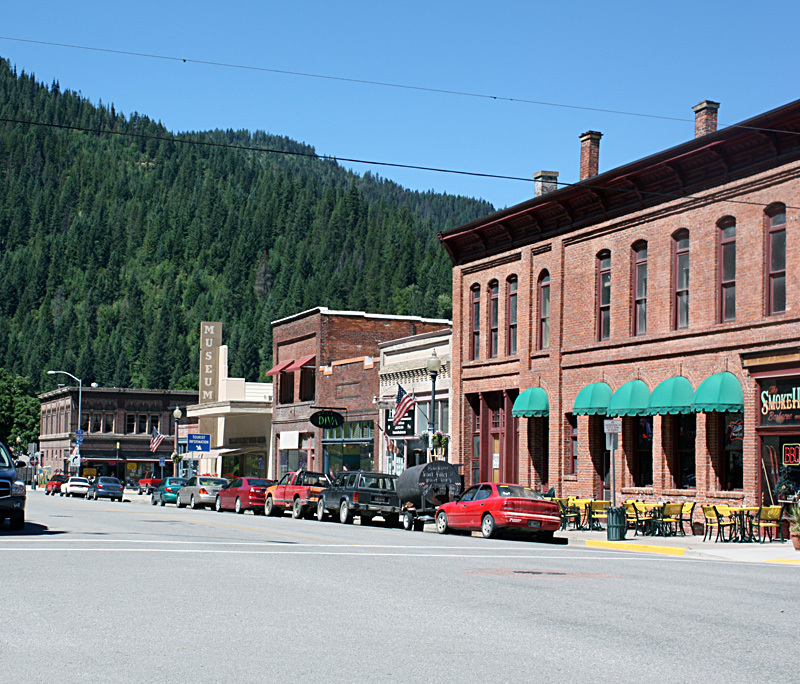 The last little unplanned side-trip we experienced on our way home was a tour through the historic silver-mining town of Wallace, Idaho. You know how you can pass interesting-looking places over and over and never stop for a look. Wallace is one of those places. It has a shrinking population of fewer than 800 people and seems to keep adding festivals and events to help keep the town alive. Peeking into the Silver Tea Room and antique store. While walking down the street I met a man who was visiting Wallace with his wife (she was in the jewelry store) who told me they had come for a night but had had so much fun they extended their visit by a few more days. They loved the hotel, the shops and the restaurants. I took a photo through the window of the Real Estate office, in case anyone thinks Wallace might be a fun place to live — lots of festivals, good skiing and bike trails in a beautiful, historic setting. Not sure about jobs, though. That about wraps up July.